/ Reforms / Women: Lord, Why Am I Banned from your Abode? women from different religious communities are making their statement loud and clear that their march towards equality cannot be halted by these institutions, and that’s is the portent of these moves for entry to the abodes of the Lord! One is witnessing strange incidents where the women from Muslim and Hindu community are facing similar obstacles. This relates to the issue of entry into places of worship. While the women from Bhumata Brigade are struggling to get entry into Shani Shingnapur temple (Ahmadnagar Mahrashtra), the Muslim women are fighting a legal battle to restore their access to mazar of Haji Ali Dargah (Mumbai Maharashtra). In yet another incident the women are trying to get the right of worship in Sabrimala temple. The Hindu women in an act of brave initiative landed up in many buses to the Shani Shingnapur temple, where they were denied the entry while police had to resort to some force to prevent their entry. 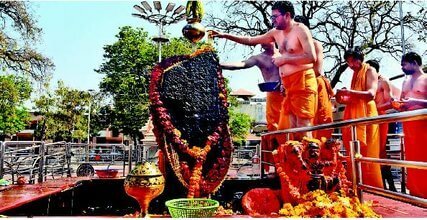 In case of Shani Shingnapur while men are allowed to the Chabutara (raised platform) it is believed that going to the Chabutara will be of bad omen for women as Lord Shani (Saturn) will cast an evil eye. So it is claimed that prohibiting women to enter is a matter of spiritual science. Sanatan Prabhat, the rightwing daily says that the movement of women must be prevented to save the Hindu traditions. In response to the agitation led by Trupti Deasai of Bhumata Brigade the spiritual Guru Sri Sri Ravishankar of Art of Living tried to mediate between the women’s group and the temple trustees. Interestingly he advised that neither women nor men should be allowed to the Chabutara. The matter is being negotiated; solution does not to be near the sight. Also the RSS mouth piece Organiser opines that while initiating any move to amend the existing regulations care should be taken to preserve tradition and prestige of these places. In case of Sabrimala shrine, the argument is that Lord is a celibate and the women in menstrual age group will be distracting him. One recalls that one IAS officer, who happened to be a woman had visited the shrine for overseeing the arrangements in readiness for the pilgrimage in her official capacity. She was also denied entrance on the ground of her being a woman. In case of Haji Ali in Mumbai the local women’s group Bhartiya Muslim Mahila Andolan has filed a writ in the court demanding the entry of women to the mazar be restored. The women’s groups have cited different clauses of the Constitution where one have equality before the law and that one cannot be discriminated against on the grounds of gender. The argument of Dargah trustees is on the ground of security of women, which to say the least is ridiculous. In case of Sabrimala the earlier argument that the path to the shrine is difficult for women on the grounds of security was later was clarified by the Devswom Board Travancore by stating the ‘real’ reason for denying entry to women is celibacy of Lord Ayappa. Muslim women have a varying degree of access to the mosques, much lesser in South Asian Countries than in countries like Turkey for example. In Hindu temples the entry is again not uniform; there are different pretexts to prevent their full access to the places of worship. While in many countries the law for equality is very much there, the traditions and the controllers of these places have been preventing the women from having full access to the holy deity. The patriarchal control over access top places of worship is there in various degrees. This does not apply to Churches in general, where access is not the issue, what is talked there is as to why women do not have the right to be on the higher levels of priest hood. In Hindu temples, Muslim mosques and shrines the women priests are practically not there, some claims of such positions will be more as an exception than as a rule or norm. In case of India where the equality is guaranteed by law, these laws of equality don’t have entry into the places controlled by the conservative trusts. The controllers of institutions of religion are generally exclusively male bastion, the degree of control and its expression is varying though. In Hindu fold there is an additional factor is that is that of caste. One understands there is ‘caste in the practice’ of Muslims and Christians also, but so far as the places of worship are concerned they are accessible to all, irrespective of caste. One recalls the struggles of Babasaheb Ambedkar for temple entry, the Kalaram Temple agitation, before he decided to renounce Hinduism calling it as being Brahminic theology. As such most religions do have the hierarchical structure in-built into the institution of religion. Talking of South Asia as a whole the Mosques, Dargahs and temples have lot of rigid rules as far as women are concerned. These are the norms which are imposed by traditions. Thus we see a bit of variation in different religions, different religions as far as treating women is concerned. As such it the differential treatment and this depends on the degree of secularization of the particular institution and particular country and region. By secularization we mean the extent of erosion of hold of landlord-clergy combine on the society. No uniform pattern is discernible but at the core there is the understanding which regards women as inferior beings, secondary to the men, being regarded as property of men so to say. Earlier it was regarded that their secondary position is purely due to biological functions, with time and with the impact of women’s movement, it is clear that the gender roles are psychological and social, determined by time and location. In early matriarchal societies women had a predominant role in the family and social affairs. With the rise of slave society and later the feudal society, women’s subservient role came to be the norm. Again with Industrial revolution and the values of Liberty, Equality and Fraternity gaining political ground, women started entering into social space and the social equations started changing towards those of equality. As degree of secularization is different the degree of success of women towards equality is different. The nations which saw Industrial revolutions, the path to women’s equality were paved by the underlining slogan of revolutions or social transformations. Still the equality of women has not been automatic, there is a path of struggle through which women expressed their aspiration; longings and struggled for new equations towards equality. The movement for gender equality again has highs and lows; ups and downs. Currently one understands that the politics in the name of any religion, fundamentalism-communalism, is a politics of status quo to begin with and then it aims to throw back the society to the earlier feudal values of caste and gender hierarchy. Talking of recent times world witnessed this first in the form of rise of Christian fundamentalism in America in the decade of 1920, in the face of the rise of industrial society with modern education and industrialization coming to the fore. In the societies which had to undergo the painful experience of Fascism, Nazism, there also the role of women were defined to be in the confines of ‘Kitchen Church and Children’ by the political ideology, which can be regarded as the close cousin of religious nationalism. With coming of Islamic fundamentalism again the attempt was made to further subjugate the women to lower positions in society. The cover of Islam was used for this social-political agenda. Afghanistan, Iran, Pakistan are few examples of that. Here in India we saw the rise of majoritarian and minoritarian communalism. Both these again try to push back the women, to restrict their social space, all in the name of religion. With the rise of religious nationalism in India, various issues came up which gave a glimpse of the attitude towards women. Many of these are not the fully blown up pictures, but they have in root the goal of subjugation of women, in the language of Sharia or a sophisticated version of Manu Smriti. In India while the secularization process; the overthrow of the hold of landlord-clergy combine; remained half way through. With the assertion of religious nationalism primarily Hindutva, the striving of women for equality is being countered strongly. In the ideology of dominating Hindutva the subordination and secondary position of women is asserted by invoking the noble traditions. In literature from Gita Press Gorakhpur, the major publication promoting traditional conservative values amongst Hindus which is generally the base of Hindutva politics, one can see millions of books being distributed which advise the home making role, the ideal of Sati (women being burnt on the funeral pyre of their husband), the stree dharma (duties of women as ordained by their religion) are propounded. Instructions to women about dress code and choice of life partner are handed down. One of the major agenda of the divisive love jihad campaign is to restrain the Hindu girls, to do away with their choice in matters of life and choice of life partner. Overall the role of religious institutions has been to maintain the social status quo, And the issues related to priesthood in holy places, the entry to these shrines do reflect the same in varying degrees. It seems that despite the obstacles, the women from different religious communities are making their statement loud and clear that their march towards equality cannot be halted by these institutions, and that’s is the portent of these moves for entry to the abodes of the Lord!